The panhard rod is responsible for locating the rear end side-to-side in the chassis. 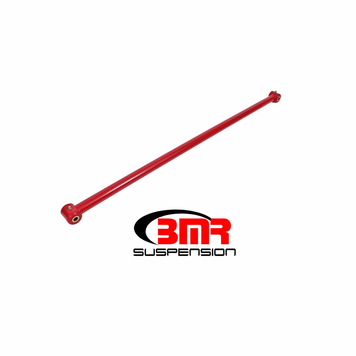 Factory panhard rods are made with small diameter tubing and rubber bushings that allow deflection under load. 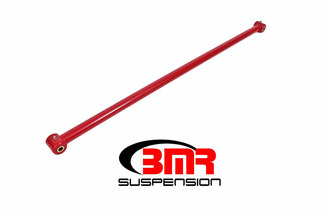 BMR panhard rods are all made from larger diameter 1.25", heavy wall DOM tubing and utilize either greaseable polyurethane bushings or HD spherical bearings by QA1. The adjustable versions use left-hand and right-hand thread to allow easy "on-car" adjustment. BMR CNC machined adjusters are made from 4130 chromoly and have rolled threads. All rod end spacers are 304 stainless. By nature, a panhard rod will alter rear end position as ride height changes. This makes it necesarry to use an adjustable panhard rod when lowering your vehicle as it allows you to re-center the rear end. Adjustable panhard rods also become a "must-have" part if you are trying to fit the widest tires possible in the wheelwell. Available in Black Hammertone.